Product prices and availability are accurate as of 2019-04-20 08:06:19 EDT and are subject to change. Any price and availability information displayed on http://www.amazon.com/ at the time of purchase will apply to the purchase of this product. 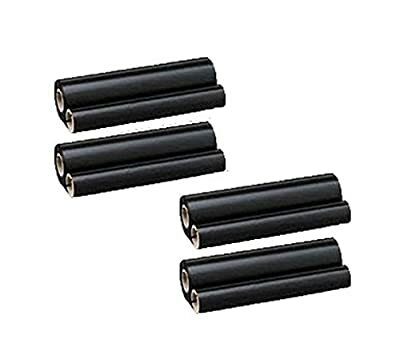 4 Pack of High Quality, High Yield Replacement Refill Rolls compatible with the following SHARP manufacturer and model #'s: REPLACES THE FOLLOWING MANUFACTURER NUMBERS: FO-15CR, UX-15CR. COMPATIBLE WITH THE FOLLOWING PRINTER MODELS: FO-1450, FO-1460, FO-1650, FO-1660, FO-1850, UX-1000, UX-1100, UX-1300, UX-1400, UX-2100, UX-3500, UX-500, UX-510, UX-600M. PRODUCT SPECIFICATION: Condition: OEM EQUIVALENT - One Year Warranty - Page Yield: 500 - Quantity: 4 Rolls - Brand: Supplies Wholesalers.